Located just west of the Village of Crivitz sits an absolute gem of a property with a 3,280 Sq Ft, 3 bed, 2 bath, open concept ranch home with finished basement and attached 2 car garage. 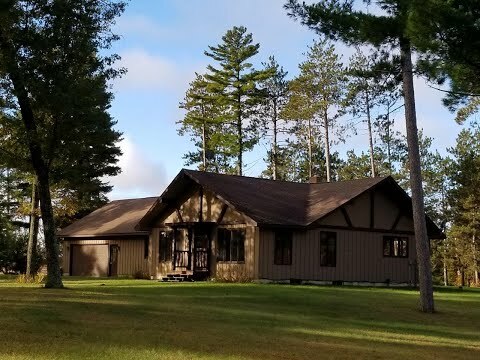 To start with the property is 18 acres with over 1400' of frontage on the Peshtigo River, which may be divided if you choose to do so. Water frontage on this part of the Peshtigo River is sandy and easily accessed all along the property. A 30' x 60' detached garage complete with power and finished concrete floor is set off to the north of the property and a 24' x 20' guest house is situated on the south side of the property. All the buildings on the property have been very well cared for and have recently had new roofs put on. Unique facts: The property has 2 wells and 2 conventional septic systems. This is because an older building had burnt down some years ago leaving behind its services. This will be nice if you were to sell off a parcel in the future.